The staff of Secure All Security is well trained and capable to do neat and reliable installations. To find out more, or to obtain a free quote in the Pretoria and Johannesburg area, contact us or complete the online form. We shall attend to your enquiry as soon as possible. Electric Gates Securing Your Electric Gates One of the main reasons that people have electric gates installed is to improve the security measures on their properties. However, many people forget that they have to secure the electric gates as well as the motors to ensure that they are tamper proof. Electric gate motors that can easily be accessed can be a weak link in any security system. Make sure that your electric gate motor is placed in a box that can be locked to make it more difficult to access. In addition you should be able to place a pad lock on this security box to further secure the electric gate motor. Electric gates can also become a security risk during power failures or other interruptions to your power supply. The motors for your electric gates should have some sort of backup power supply to ensure their continuous operation. Most electric gate motors simply use a rechargeable battery that is designed to last through normal power failures that occur for short periods of time. Alternatively, you can attach the motor for your electric gates to a generator of some sort. Make sure that the generator you choose will be able to handle the power load of the electric gates and that it will automatically kick in upon an interruption to your electricity supply. Your local security expert can assist you with these and other measures to ensure that your electric gates are safe, secure and operational at all times. It is also important to have your electric gates, motors and backup power supply professionally installed by an electrician or other type of technician who is qualified and experienced in this field. Garage Door Automation Quality Garage Door Automation Products Make sure that you choose reliable and reputable garage door automation services to eliminate the frustration of garage doors that continuously get stuck or just don’t work properly. The first thing that you need to do is ensure the quality of garage door automation motors that you choose. Find brand names in the industry that are well known and have had many years of experience in producing a high quality product. Remember that the accessories and components such as tracks and rails should also be of the highest quality to ensure reliability. You should also ensure that your garage door automation is professionally taken care of. There are a large number of companies that offer the products but do not offer an installation service. This means that you will have to find an independent garage door automation expert to make sure that your garage door automation is installed correctly so that it functions optimally. Keep in mind that whether you receive this service from an external provider or from your garage door automation supplier this service will usually come at an additional cost over and above the cost of the equipment you will require. You also need to make sure that you receive a guarantee or warranty for the garage door automation that you receive. This warranty will protect you from having to shell out extra money to repair the gate motor and components due to manufacturing faults. The warranty or guarantee that you receive has the additional benefit of offering you assurance that you have chosen quality garage door automation products from your supplier. Find out if the installation will also be guaranteed from your installation service provider or the supplier of your garage automation equipment. Garage Door Motors Pretoria Installing Garage Door Motors In Pretoria There is one very important reason other than just convenience for installing garage door motors in Pretoria and this is for security reasons. Garage door motors can be of even more significance to your safety and security should you garage doors face directly onto the street. This basically means that you will be afforded the benefit of remaining in your car while the garage doors are open and only exiting the vehicle once the garage door motors have shut the entrance from any potential intruders. There are many different types of garage door motors in Pretoria for you to choose from. Most of these can simply be installed to automate your existing garage doors or you can choose to purchase new garage doors with a motor attached. You can choose between wall, ceiling or even floor mounted garage door motors. 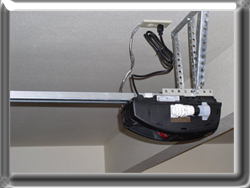 It is important to assess that you have available for the garage door motors in choosing the type of mounting that will best suit your requirements. You can ask for professional advice from your garage door motors supplier as to which type of motor will best fit into your space. Remember to request professional installation for your garage door motors. Automated garage door motors are notoriously moody and break down on a regular basis and this is mainly due to bad or incorrect installation of the equipment. Try and opt for garage door motors that have a back up battery supply so that you will not have to manually open the garage doors when there is a power outage which is all too common in South Africa. Make sure that you have remote access as well as internal switches that you can use to operate the garage door motors. Gate Motors Pretoria Ways In Which Gate Motors In Pretoria Can Keep You Safe Are you aware that you are at your most vulnerable to attack and hijackings when leaving your home or arriving back on your property? The minute that you leave your car and are standing defenceless is when the criminal elements in South Africa are the most likely to strike. There is one simple way that you can prevent this from happening to you and that is by simply installing gate motors in Pretoria so that you don’t have to leave your car when you leave or arrive at home. There are a couple of simple security techniques that you can also employ to ensure that your gate motors in Pretoria provide you with the security you need. First be vigilant and never start the gate motors until you are sure that there are no loiterers standing about your property. These loiterers can slip in while you are busy doing something else and the gate is opening. Secondly, never leave your vehicle until the gate motors have stopped running and your gate is closed. Not doing this leaves you in the same vulnerable position you would be in if you did not have gate motors. And last but not least, make sure that your gate motors are secured and locked away from prying hands. Gate motors have a manual switch in the event that there is no electricity in which event the gate motors cannot function. These switches can be manipulated to allow intruders access should you not lock the gate motors away securely. You can also choose gate motors that have a back up battery electricity supply so that you will have your safety and security even when the power is out. Security Gates Pretoria Improve Your Security Measures With Security Gates In Pretoria When you are looking at .improving the security arrangements on your property you need to pay special attention to the access points. These access points don’t only include the entrances to the property itself but to your home and other buildings. Security gates in Pretoria are the ideal means to strengthen these points of access to your home. Remember that professional installation is the key ingredient in employing security gates to provide you with a greater level of protection against intruders or any other unauthorised individuals from gaining access to your home. There are many different types of security gates in Pretoria for you to choose from. You can select traditional solid security gates or you can opt for the more modern retractable security gates. Retractable security gates offer you a higher level of protection especially when they are mounted with a slam locking device. This means that you can simply close the gate without requiring a key to lock it. Retractable security gates are also neater and tidier in your home as they can be folded away conveniently to be out of the way when they are not in use. In addition to employing security gates at your access points, you can additionally install them inside your home. It is recommended by most security experts that you separate the sleeping quarters in your home from your living quarters. This is the ideal place to have security gates installed that can be locked at night to keep you safe while you are asleep. You can also have security gates installed in the individual doorways to rooms or in archways or other areas where no doors exist to further up your security level. Centurion Gate Motors Some Features Included In Centurion Gate Motors There are basically two types of Centurion gate motors for you to choose from. The first type is a sliding gate motor. A sliding gate motor operates by moving the gate along a set of wheels or castors that are fitted to a sliding rail. When choosing this type of gate motor there are a couple of features that you need to look out for to ensure optimal operation. First consider the smooth action of the gate. Automated gates that move along struts or cogs can easily become stuck and so you should choose gate installation with a smooth sliding rail. Make sure that the Centurion gate motors you choose have a back-up battery supply. With rolling blackouts and the unreliability of the electricity service delivery in South Africa you don’t need to be stuck when you gate won’t open due to a lack of power. Speed is another factor to consider when choosing Centurion gate motors. The faster your gate opens and closes, the greater the safety and security that you will profit from. This requires a gate motor that has the capacity to move the weight of your gate as well as enough push force to get the gate moving. 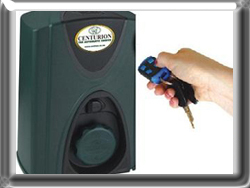 A convenient added extra is to choose Centurion gate motors that include a timing device. A timing device will shut your gate after a set period of time in the event that you have forgotten to do say. It is human nature to forget things especially when we do them by rote and the addition of a timing feature can give you peace of mind that your gate will be closed and your property secure when you have other things on your mind. Gate Automation The Security Aspects Of Gate Automation The reason that most people choose garage and gate automation is purely because of the convenience of never having to get out of your car to open and close gates and garage doors again. There is however one other factor to choose gate automation other than the convenience that it offers and this is for security reasons. There are many aspects of garage and gate automation that provide you with improved security measures. Just think about it – the minute you leave your car to open the gate to your property, you become vulnerable to hi-jacking or attack. With gate automation you don’t have to leave your car at all and can simply press a button on a remote control device to open the gate automatically. The same thing goes for leaving your car to open your garage door especially if it is facing the street. Intruders and other undesired persons can also sneak unsuspected onto your property while you are in the process of entering your property. The risks of this happening to you are just too high not to consider automating the entrances to your property. Another great security feature of gate automation allows you to open and close your gate to admit guests without ever having to leave your home. This can be done either by using your remote or you can have a switch installed in your home to activate the gate motor. Used in conjunction with an intercom system, you can easily identify who is at your gate and what their reasons for entering your property are. You can further install CCTV cameras at your access points so that you can see what is happening around your gates at all times. Gemini Gate Motors Reliable And Robust Gemini Gate Motors Gemini is one of the leaders in the industry for supplying reliable and robust gate motors. Their years of experience in the industry have allowed them to manufacture Gemini gate motors that have all the necessary functions as well as a few added extra’s to make life that much simpler to deal with. These features do however not come standard with all Gemini gate motors so make sure that you research the different makes and models of the different gate motors to ensure find one within your price range that meets your needs. Apart from the standard in or outdoor switch to open or close the gate, Gemini gate motors also provide you with a remote control function. You can also choose to have a pedestrian gate with an electronic, magnetic or normal locking system inserted into your automatic gate. In addition to this you can have infrared sensors installed on the gate to give you the peace of mind that the gate will never close on your car or while there is an obstruction in the path of the gate. Variable timers are another great feature that you can get with Gemini gate motors. This variable timer will ensure that your gate closes after a chosen interval of time has passed even when you forget to close the gate. Remember that the main reason many people choose Gemini gate motors is to enhance and improve upon their existing security measures and the access points to your property should always be your main concern. Other products that are related to security and the automation of your access points are also available from Gemini gate automation specialists. Security Gate Motors Choosing Between Sliding And Swing Security Gate Motors You can choose between either a single and a double swing gate motors. However, when opting for a single swing security gate motors you may need to compromise on the length and weight of the gate. Single swing gate motors are only designed to open and close smaller gates to allow the width of one car access at a time. Double security gate motors are identical in design except that one motor is placed on each side of the gate giving access to two cars at one time. The choice between these two security gate motors is entirely dependent on you requirements. If you have a double lane driveway, it is probably best to opt for the double swing gate option. Single gate driveways are suitable to either single or double swing gate motors. It is also important to ensure that you have enough space to allow the gates to swing in your driveway without touching any structures or cars in the driveway. You need to first assess your space availability and then determine whether the gates should swing inwards or outwards to allow enough room for you to manoeuvre. Should you not have enough space available or the swing security gate motors it is probably best to consider having a slide gate installed. A slide gate rolls along a rail and does not require any space in your driveway when opening or closing. You also have the option between a double or single automated sliding gate. Just remember when selecting double sliding gates to choose security gate motors that are strong enough to open and close the gate quickly and conveniently without getting stuck. Security Gates Different Types Of Security Gates One of the most basic safety measures you can install to protect your home, property and loved ones are security gates. There is a wide range of security gates that are available on the market but whichever you choose there are some basic principles that the gates must adhere to. First and foremost the gates must fulfil the application for which they were designed for which is security. This basically means that you should gates that are made from strong materials that will withstand a great amount of force. The security gates must lockable and the locks must be tamper proof. Slam lock security gates are becoming more and more popular as no key is required to close the gate quickly and conveniently. Another gate lock that is gaining popularity but is still rarely seen is a magnetic gate lock. A magnetic gate lock requires a remote control, security swipe card or a password activated key pad to lock and unlock the gate. This is great to improve your security measures as no key is required that can be lost, stolen or copied. These gate locks are widely used in a variety of offices and business premises in South Africa. You can also choose between standard or retractable security gates. Retractable security gates have an advantage over other types of security gates as they can be used both in and out of doors. The gates can easily be folded out of the way so they do not obstruct traffic or your view when they are not in use. However, these retractable security gates can be more expensive than the standard options so it is important to weigh up your need versus your budget for security gates when choosing between these two options.